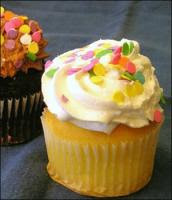 Special thanks to BJ for her tip below on using cornstarch for cupcakes! I have heard rave reviews her cupcakes, the texture and consistency especially. Stir together until smooth and add to recipe like you would a beaten egg." It is **key** to mix all the ingredients together before adding it to the recipe. For her first batch she hadn't done that and the consistency was not as good. Can't wait to try it..haven't had much luck so far with egg substitutes. Most recipes call foe Ener-G and I don't like the funny taste it leaves in cookies or cake. Thanks for the info as always!!! Let me know how it goes guys! Tina, feel free to send me a pic of your eggless creations! i shall be trying this out next week :) got family coming over. cant wait. These cupcakes turned out really really well. The only alternation I made was that I used milk instead of water for the egg combination. I also used a little bit of milk. Thank yo so much for this recipe. Just curious how well this recipe works. I have tried other eggless methods for cooking cupcakes and while the cupcakes tasted good, they crumbled easily! I would love to hear from those who have tried it!